Trundle transforming where children sleep. We collaborate with kids and their caretakers to create safe, inspiring spaces where they can dream. Combining creativity, a small budget and teamwork, we make visible progress, quickly. Children learn that they don't have to settle for things as they are. Simply applying a fresh coat of paint, they prove to themselves that they can begin to change the walls and world in which they live. Co-founded by Maris Garcia and Kristen Zelenka. Flipping our first sleep & study space with the Quillos! Construct: Pulling it all together in one weekend! From a crowded room with tired off-white walls and out-grown beds to a fresh new space where they can calmly sleep and study! We unloaded the new furniture, and the team began to put it together. A bookcase was assembled quickly and then Memo and his father bravely volunteered to take on the complex dresser construction. The rest of us began to paint. Within minutes of applying primer and fresh coats of paint, the room took on a whole new feel. Thank you to Sherman Williams for donating all of the paint and painting supplies! We selected Blue Mosque to accent one wall and covered the rest with Rock Candy, a bright, light grey. Photo break with the blue wall primed and the grey walls after one coat of paint. Danny, Joanna and Juana, their mother, took the lead on painting. We applied one layer of primer and two coats of paint to the blue wall because the color was so rich. Since the grey walls were less intense, we were able to apply just two coats of paint. The blue wall sings of happiness and the grey beautifully opens up the space while calming it down! The team worked hard and fast – waiting in between coats for the paint to dry, but finishing all of it in just one day! tarps: Throw a tarp on the floor to avoid getting paint all over! primer: Purchase primer if you're applying a darker color paint to a lighter wall or a lighter color paint to a darker wall. Primer is less expensive than paint and will cut down on the number of coats of paint that you'll need to apply to get a full and even look. "oops" paint: Save money by purchasing "oops" paint. This is paint that has been returned but not used. Painting stores may have a variety of colors available. Just ask! removable liners: Save time and reduce the mess with paint trays with built-in removable liners. When painting walls different colors, these trays make it easy to go from rolling one color or primer to the next. You just pull up the plastic and find a clean tray below! 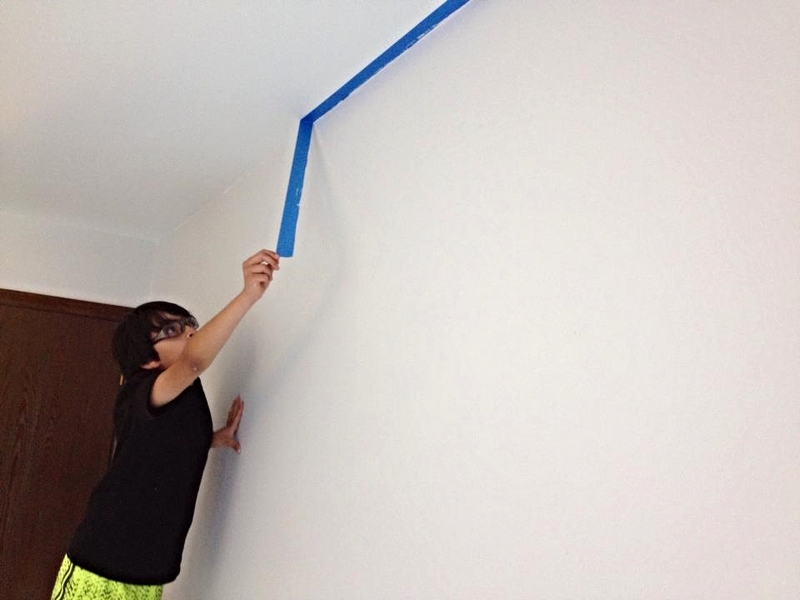 painters tape: Tape off a room before painting to help create a straight edge between two different surfaces and colors. Place the tape along the surface you don't want the paint to approach. Use a paint brush or edger to get close to the paint. Once the paint is dry, you can pull it off and inspect your progress, just like Danny! paint shield: For an even cleaner line, use a paint shield to block paint from seeping under the tape. As Joanna is doing, place it in the edge between surfaces and use a brush to paint underneath it. "w" formation: Apply paint to the wall with a roller in a "w" formation to get the paint off of the roller and spread evenly onto the wall. When the evening wrapped, all of the new furniture was built – 1 bookcase, 2 dressers, 1 desk and a loft bed the family purchased for Danny from Craig's List for $90 off of the original price. We were thrilled and exhausted from accomplishing so much in one day! Day two kicked off with a helpful start from Spunky Dunkers! After devouring a box of their delicious donuts, the siblings got to work on personalizing their space by painting craft paper initials to hang on the wall. Our last piece of furniture – Memo's new bed – was delivered, quickly assembled and put into place. Thank you to Bedding Experts for a significant discount on the bed! Memo now has a sturdy, comfortable and right-sized bed to sleep on each night. New duvet covers and pillow cases came next for the final touch. The different black, white and grey patterns, chosen by the boys, complement the light grey and blue walls while showing off their personal styles. Finally, there was only one more thing left to do... dedicate the space! You will soon be able to order your own copy of this poster from this site! All proceeds will go towards the future Trundle transformations. After two days of hard work, an incredible transformation had taken place. Thank you to everyone who has supported this first Trundle transformation. The Quillo Family For welcoming us into your home, embracing us like family, truly partnering with us and working so hard to make this happen!